Replaces PRBR104 power supply. Includes US power cord. Compatible with Basler ToF camera. VI and FCC Class B approved. 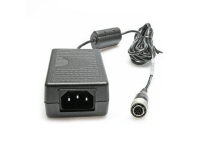 Input Power 120 - 240 VAC, 50 - 60 Hz, 1.0 A max. Output Power 24 VDC +/- 5%, 1.67 A max.